As I’ve commented before, I tried experimenting with a Linux/Windows laptop, and it wasn’t terribly successful. I realized that I don’t need a lot of power and was really looking at the netbook segment. I was also trying to see if I could make an iPad really work for my main device (assuming that I’m not replacing the iMac desktop). There are legions of comparisons of iPads to various other devices so I won’t rehash that. Suffice to say, that I felt like I needed a keyboard and a slightly richer editing environment. So, I still needed a laptop, but I really like the portability of the iPad. You see where this is going, right? 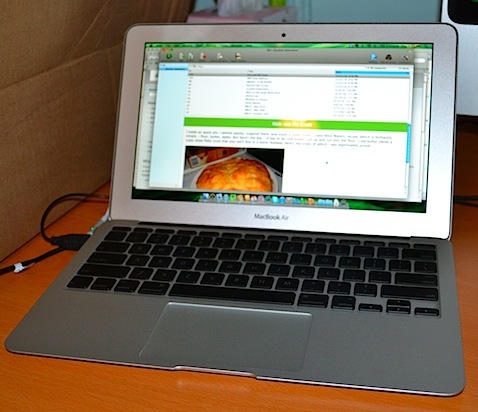 Enter the 11″ MacBook Air. I was totally put off of the previous generation due to the cost, but the 11″ is reasonably priced, incredibly portable, a full-on computer, and, did I mention, it’s fast. I’m not encoding video. I’m writing. I’m doing occasional development work (with TextMate – not eclipse). And I’m surfing. The 1.6ghz/4gb RAM machine is perfect for all that. I assume the SSD has a lot to do with it’s apparent performance, but I don’t care about the specs anymore. I care about the experience, and the MBA provides an awesome experience. I know there are some long-term issues with SSDs failing, and clogging with old files, but I’m diligent with back-ups and I’m pretty comfortable with the “what might happen” risks that its just not a bother to me. So, here it is – my new toy. Yes, that’s a regular pen on top of it for scale.